For our final outing on Wednesday 12 April we took a day-long tour to, and around, the Isle of Bute. This trip involved driving north along the western banks of Loch Lomond on the A82. At Tarbet we turned onto the A83 and drove over the “Rest and be Thankful Pass”. The drive over the “Rest and be Thankful”, with its panoramic view, was spectacular. We turned south onto the A815 along the eastern shore of Loch Fyne with views to Inverary on the Loch’s western shore. We then turned inland on the A886 along the edge of the Glendaruel Forest before emerging onto the shores of Loch Riddon at Auchenbreck. The drive along Loch Riddon was a picturesque one with views down to the northern end of the Isle of Bute. At its southern end, Loch Riddon splits to form the Kyles of Bute sea channel which passes around both sides of the Isle of Bute. The main road ends at Colintraive, where the Cal Mac Ferry departs for Bute. We bought an “island hopscotch” ticket giving a cheaper, combined fare for that crossing, plus our return from Rothesay. The ferry from Colintraive is small vessel holding only about 20 vehicles on its open desk. The crossing is only 5 minutes and we hardly had time to jump out of the car to take some more photos before we had to rush back to disembark at Rhubodach on the northern end of Bute. After stopping to take some pictures of the returning ferry, and scenery generally, we drove southwards to the island’s main town of Rothesay. It has to be said that the town of Rothesay does look a little ‘down-at-heel’; however, this interesting port town has lovely views over the Kyles of Bute towards the Ayrshire coast. Interesting visitor attraction at Rothesay – green marble urinals! Behind the seafront is a warren of slightly dingy shopping streets set around the ruined 13th Century castle. We decided not to visit this castle which is an unusual circular shape.On the promenade there is an impressive Visitor Centre, including a tourist information office housed in the former Winter Gardens Theatre. This has lots of interesting multimedia displays of Bute’s heyday as a day trip destination – “doon the watter” by paddle steamer for the Glaswegian masses. Adjacent to the Winter Gardens, on the promenade, there are some very pleasant floral gardens. A more unusual visitor “attraction” is the nearby Victorian gents public toilets. Although the tiled exterior of the building is nothing of note, the interior is a very different matter. 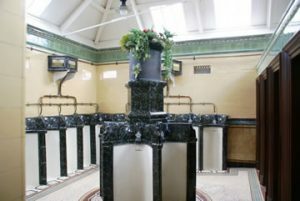 The 14 original porcelain urinals lining the walls are topped with imitation green St Anne’s marble and there is a circular centrepiece of 6 more urinals. The urinals are fed by the original glass-sided cisterns via mirror-finish copper pipes. The WCs and wash basins continue this grand and decorative theme, all of which are set off by the sunlight from the glass roof. After visiting the glories of Rothesay, we took the coast road south past the unending row of Victorian guest houses before stopping for a pleasant picnic on one of the many benches overlooking the Kyles of Bute. This vantage point gave a lovely vista with distant views of the Ayrshire coast and the opportunity to watch the arrival and departure of the large Cal Mac car ferries travelling between Rothesay and Wemyss Bay. After lunch we spent the whole afternoon touring the beautiful Isle of Bute. We drove southwards, keeping as far as possible to the minor roads along the eastern coastline, before finally taking the narrow B888 to the village of Kilchattan Bay at the end of the east coast road. This route gave us lovely seascapes to Islands of Great and Little Cumbrae. We then returned to the village of Kingarth and took the A844 which followed the western coastline northwards. We stopped several times along this route to visit the sandy bays at Scalpsie and Straad. There were lovely views to the nearby isle of Inchmarnock, the more distant Isle of Arran and the Kintyre Peninsula. We stopped at the southern end of the sandy beach at Ettrick Bay. We then continued northwards and eventually turned west on the B875 to visit the northern end of the Ettrick Bay, where there was a café. From Ettrick Bay we took the single track road skirting the western coastline with views across the western Kyle to Ardlamont Point. We then retraced our route and took the A884 back across the island and rejoined the A886 at Port Ballantyne just north of Rothesay. 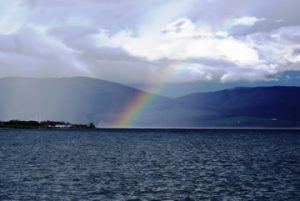 A rainbow over the lochWe then took the short journey back to Rothesay stopping en route to photograph a rainbow dipping its tip into the Kyle. After a short wait in the early evening we caught the Cal Mac ferry from Rothesay to Wemyss Bay on the Ayrshire coast in the early evening. This was a much larger ferry which had a comfortable lounge, snack bar, etc. The crossing was a smooth one, although it was very windy when I ventured onto the open decks to take some photos. On disembarking from the ferry we took the A8 northwards from Wemyss Bay. We then turned onto the A770 which gave us a scenic route along the southern banks of the Clyde through Gourock and Greenock. At Greenock we rejoined the A8 through Port Glasgow. We then took the M8 and M898 back to the Erskine Bridge. After crossing the bridge we took the A82 back to Balloch where we stopped briefly to buy a fish and chip supper which we enjoyed back at the caravan. The Isle of Bute trip was our final day on Milarrochy Bay, and after packing up on Thursday 12 April, we hitched up for our journey home to St Helens. This trip was not without some drama. Just south of Carlisle, travelling on the M6, we were held up for over an hour when all 3 lanes of traffic were stopped by a serious accident involving several overturned container lorries. After about an hour the police allowed the “stranded” southbound traffic to continue past the accident. However, when I tried to start the car’s engine I was horrified to discover that it had a flat battery. As our “Sorento” is an automatic, we were marooned in the inside lane of the motorway needing a jump-start. I had to quickly deploy our warning triangles and phone for the breakdown service. Despite desperately pleading that all I wanted was a tow onto the hard shoulder and a jump-start, the Green Flag operator insisted on going through a very lengthy list of questions about our outfit before promising to send a breakdown truck within the next hour. The motorway behind us was still closed at this point so at least there was no traffic approaching us from behind. I was very concerned about our location on the actual motorway carriageway when the traffic restarted and so I phoned the police emergency service. The police operator was very reassuring, even phoning me back to tell me that I had not been forgotten a little while later. After about 30 minutes, two Highways Agency Officers arrived in a Land Rover Discovery and towed us to the relative safety of the hard shoulder. Just after that, a passing RAC patrol man very kindly stopped and jump-started our car using a power pack. We were forced to wait another couple of hours at the accident site, with our engine running. Eventually a large mobile crane moved one of the lorries involved in the original accident sufficiently for the traffic, including us, to squeeze by. We then continued our homeward journey without further mishap, although we did arrive home much later than planned, at midnight – oh the joys of caravanning! A postscript: However, when and if we return to the area we will probably NOT stay at Milarrochy Bay CCC Site again as we discovered a better alternative at the Cashel Forest Fields Campsite whilst we were out exploring during our holiday. This site is located about a mile past the Milarrochy Bay Campsite on the same dead-end road to Rowardennan. Formerly a Forestry Commission site, Forest Fields sites are now managed by the Camping and Caravanning Club with similar terms and prices. We thought that the Cashel site was better than the Milarrochy Bay site because of its position with a more open aspect, giving it superior views along the Loch northwards to the mountains. It, too, is on the lochside, and the most expensive “select” pitches (EHU, hardstanding and picnic table!) are right at the water’s edge with views-to-die-for. In addition, the site has a well-stocked shop. The wardens were very helpful, allowing us to look around the site and willingly answering our questions. The only disadvantage to both sites in my opinion is that it is necessary to drive about 6 miles on minor roads to reach main A811 road when travelling to anywhere else. From a peacefulness point of view that is, of course, an advantage! A final tip – if you are travelling to this area in the near future via the Erskine Bridge and up the A82 to Balloch, I would recommend you check the traffic bulletins. We were held up in LENGTHY delays at roadworks between the Erskine Bridge and Balloch on both our outward and return journeys. The roadworks may have finished now, of course. Header banner image credit to Abubakr Hussain, Mohammed-Hayat Ashrafi, Maaz Farooq, Farmaan Akhtar, Mohammed Shah (Digital Camera) [CC BY-SA 2.5 (https://creativecommons.org/licenses/by-sa/2.5)], via Wikimedia Commons.